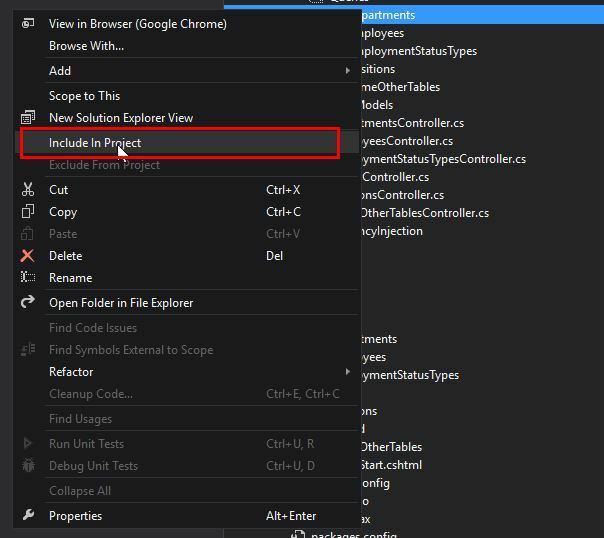 Effinator is a open source application developed in C#.Net basically its a code generator to build your Basic Architecture based on Entity Framework this work well with the architecture structure I explained on my article earlier so its best to read that first for a better understand. But in a gist, with this tool instead of writing CRUD codes for each database table this project will generate it for you saving you time and effort in creating a repetitive process. 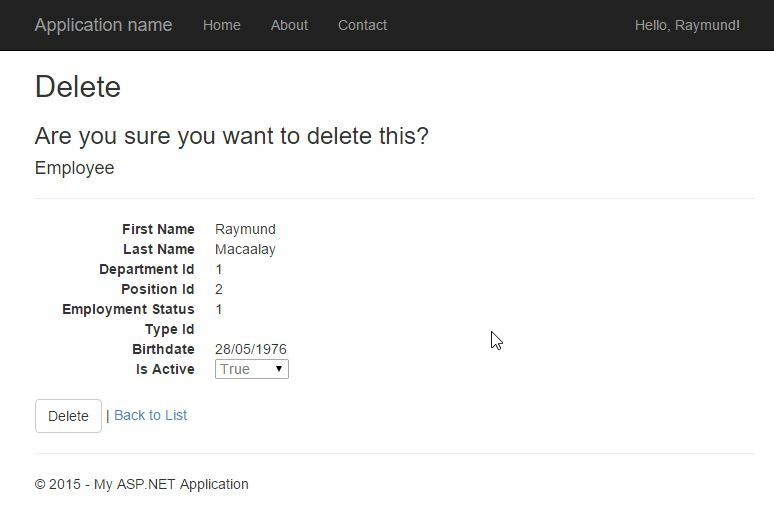 In this project I also added code generation for views which will have the same look and feel as the default template of ASP.Net MVC on Visual Studio so each database table is represented as a grid with their own views complete with a menu that exposes it as a database setting. So what does this tool generates? of its benefits but another benefit in using Sharpener is making sure that you are following the proper naming and coding convention for your project. 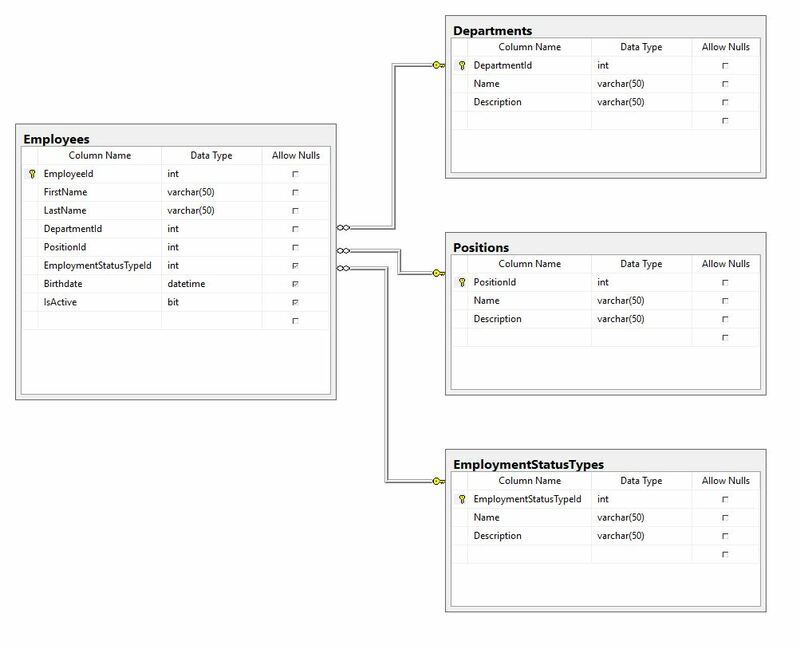 Lets say we have the following simple database structure below as an example to set things into perspective. So how does each class and interface look like? How does each file look like? Let’s separate them by Layers so its easier to understand. 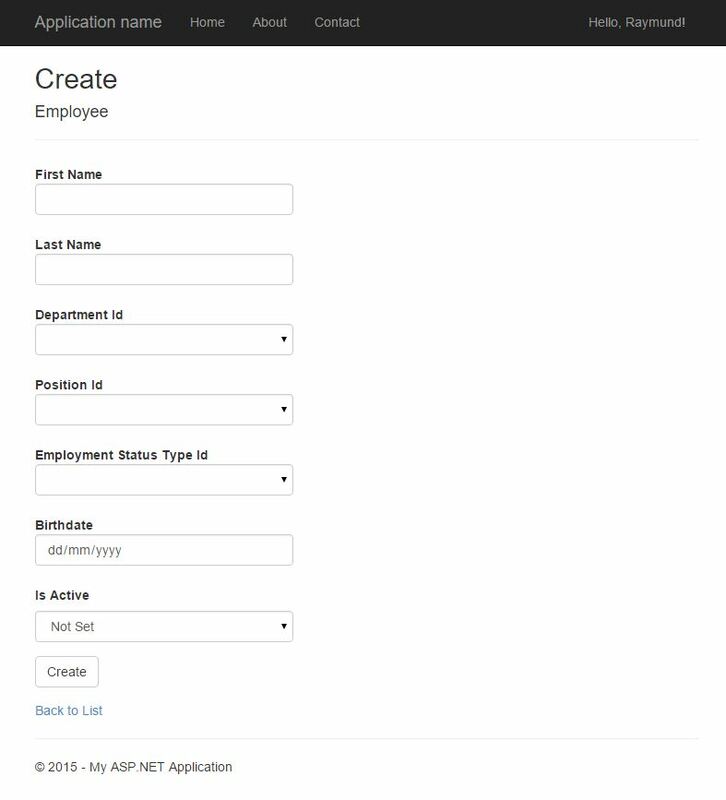 DatabaseFactory.cs – This is the class that will connect to your Data Context, so in short it contains factory methods for creating Database objects. Disposable.cs – This is for Garbage Collection, making sure we clear up the resources used. GenericRepository.cs – This class contains all the generic methods that you can perform for your entities, methods like Add, Update and Delete. 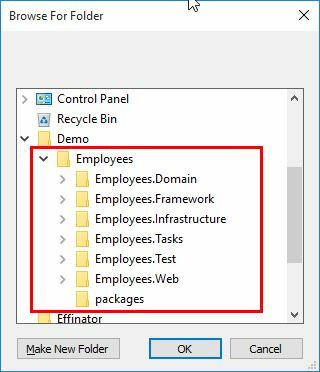 UnitOfWork.cs – The unit of work class coordinates the work of different multiple repositories by creating a single database context class shared by all of them. CommandHandlerNotFoundException.cs – This class will take care of non existent command handlers. CommandResults.cs – Similar with the Command Result but this is more for a collection. ValidationHandlerNotFoundException.cs – Takes care of any Validation Handler that is not found. Now for the specific Delete, Update and Add Commands and CommandHandlers for each entity. SaveOrUpdateEmployeeCommand.cs – Used for Saving and Updating Entities. DeleteEmployeeCommandHandler.cs – The handler for the Delete Command. The View Models is divided into 3 types, one for individual ViewModel to Entity Mapping, another for use in Grids or any Collections, and the third one is a sub ViewModel for Foreign Keys. EmployeesForeignKeysViewModel.cs – Model for foreign keys that are exposed as a Collection of SelectListItem so we can easily use them for drop downs. 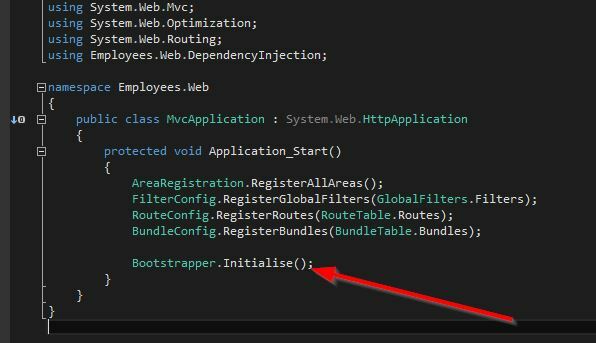 Now lets go to the controllers, this one will be straightforward it will be nearly as similar as the default ASP.Net MVC Template. 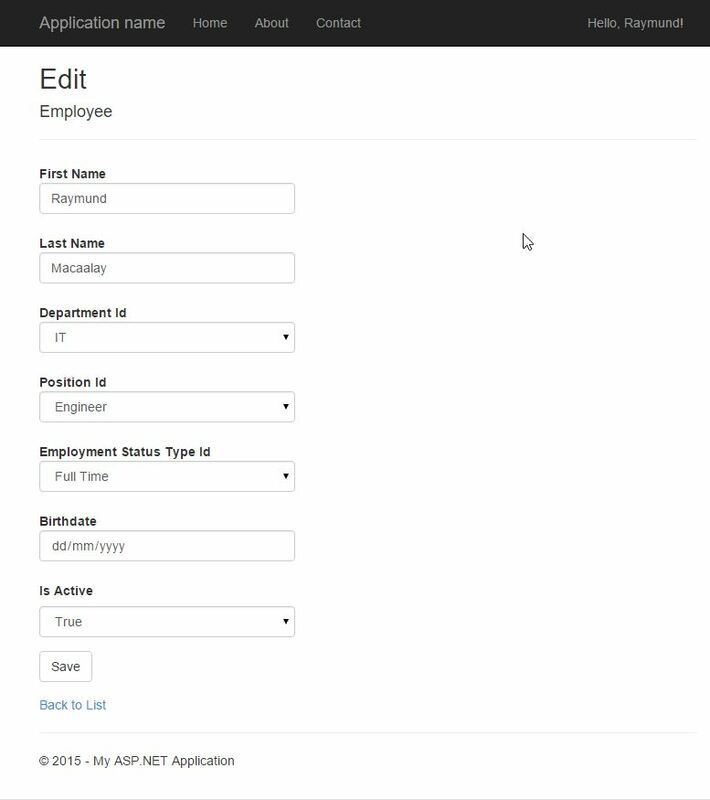 EmployeesController.cs – All of the common Actions are implemented like Index, Details, Create, Edit and Delete separated by POST and GET request. // more details see http://go.microsoft.com/fwlink/?LinkId=317598. Then the Dependency Injection items, AutoFac is used in this instance. Bootstrapper.cs – The main class to inject dependencies for your Controller, Query, Repository and Tasks. ControllerInstaller.cs – Registers your Controllers. QueryInstaller.cs – Registers Assembly Types in your Web Project that ends in Query. RepositoryInstaller.cs – Registers all your Generic Types in your Tasks Layer, this also registers the Repository Assembly types in your Infrastructure Layer. TaskInstaller.cs – Registers your Command Processors, Command Handlers and Validation Handlers. Now to use this applicaiton, you need to use Entity Framework with my preferred architecture setup as discussed here (http://www.macaalay.com/2015/10/20/creating-a-solid-architectural-foundation-from-scratch-is-not-really-that-hard/). 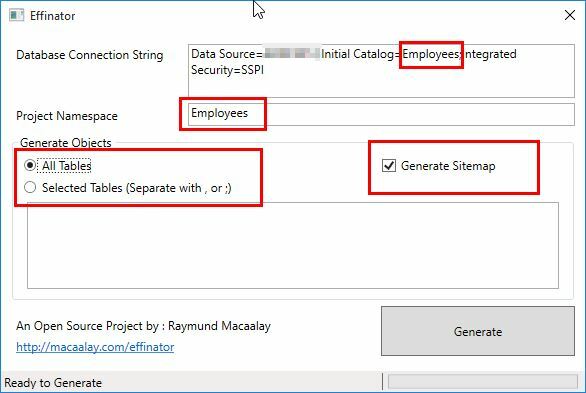 Next is to create your database but if you have one already make sure they are named properly and have primary and foreign keys properly created, see guide on link above for conventions. So lets start, lets say you have a simple Employees, Departments, Positions and EmploymentStatusTypes like the one above. 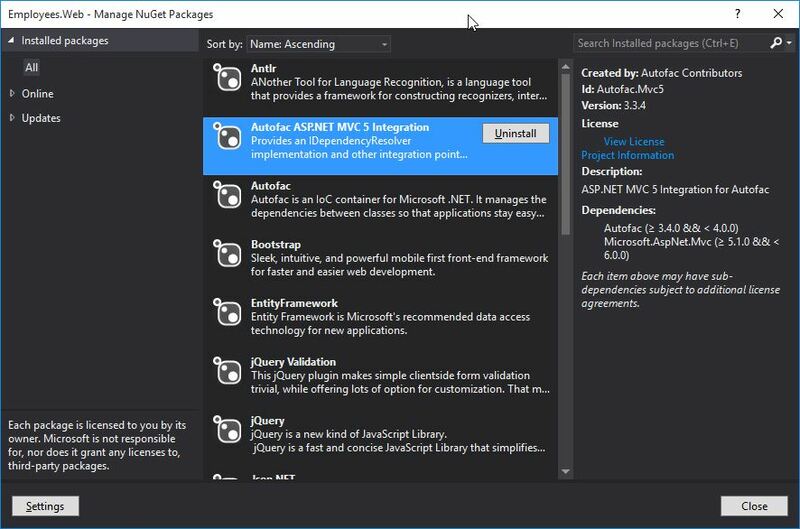 Run the application and define your parameters, such as connection string, your project namespace and what objects to generate. Please take note if you have an existing class with the same name it would overwrite it. Run the project then you will see a whole CRUD process.